A Button fires its Click event when you press and release the left mouse button. A RepeatButton, on the other hand, fires Click events continuously, as long as you continue holding the left mouse button down. 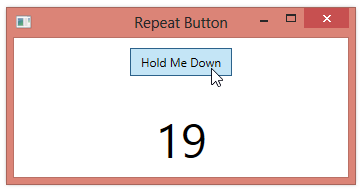 In the code-behind, we increment a counter every time the Click event is fired. The number increases while we hold the left mouse button down.